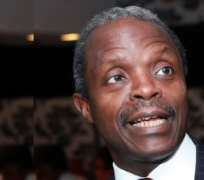 The running mate to General Muhammadu Buhari of the All Progressives Congress (APC) in next year's presidential election, Prof. Yemi Osinbajo, has called on Nigerians not to vote for President Goodluck Jonathan, as doing so will only attract hunger. He said Nigeria under Jonathan has already been entrenched in deep poverty and that retaining him for a second term would mean more hunger, saying the time had come for power to change hand at the centre. Osinbajo spoke on Tuesday at a Town Hall Meeting with artisans, tradesmen and farmers, organized by the Lagos State Government. According to him, only those who loved poverty and want to remain perpetually in hunger would vote for President Goodluck Jonathan in 2015. 'No one is ignorant of all that is happening to us in this country. No one likes hunger and poverty but people are hungry. In 2015, only those who love to continue to be hungry would prefer that the government in power at the center remains there. 'By God's grace, we will remove them from the seat of power. The people there presently cannot do anything because they don't know how to. They lack the capacity and capability to govern the country. I pray for the farmers and artisans that the Lord will bless us in the incoming year,' he said. Also speaking, the APC Lagos governorship candidate, Akinwunmi Ambode said APC from the period of Bola Tinubu to Governor Babatunde Fashola has continuously provided good governance to the people of the state, saying if voted into power, his government would not deviate from the principle. He appealed to Lagos residents to vote massively for him during the governorship election and for Major General Muhammed Buhari at the presidential election next year. 'Our promise to you as a party is to provide good governance and able leadership. We want to take good care of your businesses. If you have been making N1000 profit before, what we want for you is, after providing all the facilities you need for your business that your profit swells to N10, 000. 'We know that when you make more profit, you will have more to take care of yourself, your children and your home. We promise not to stress you with our policies. I also want to remind you that no matter what we do, if we do not take over the central government, we may be hindered in a way and may not be able to provide all that we want to provide for you,' he said. Speaking, Governor Babatunde Fashola stated that if Nigerians observed and analyzed the situation of the country critically, they would find that the country is not better off than it was in 2011, urging Lagosians to vote for the APC candidates. 'The time to make a very important decision is here. Your request for continuity in Lagos is what I support. But for that project to continue, it will require you to vote for our party in 2015 election. If you vote for him, not only will he continue but will improve on what I have done. 'Also, our party has during its primaries elected General Muhammadu Buhari and Professor Osinbajo, if you vote them into power in 2015; you will have successfully rescued this country from destruction,' he said.